Given two images, that may or may not overlap, i2Align™ has two inter-related jobs: to decide if the images do indeed overlap and, if so, to compute an accurate mapping between the two images. i2Align™ achieves this using a three-step process: (1) generating initial estimates of the inter-image transformation, (2) refining the most promising initial estimates, and (3) deciding if any of the resulting estimates align the same structures from the two images. The earlier Dual-Bootstrap algorithm (GDB-ICP), IEEE Trans. on Pattern Analysis and Machine Intelligence Nov 2007, which we developed with colleagues and fellow students at Rensselaer Polytechnic Institute, used matching of SIFT features to generate initial estimates, a region growth and model selection algorithm to refine the estimates, and a combination of stability, accuracy and orientation-consistency measures to make the final decision. Each of these components has been replaced with a proprietary new technique in i2Align™, which is now more intelligent and faster than the Dual-Bootstrap algorithm. 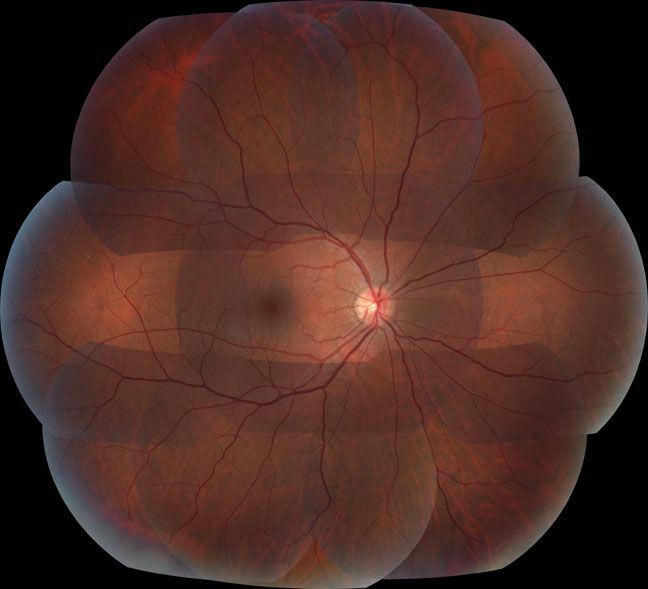 One example of the power of i2Align™ is the following gif animation of the alignment between a red-free fundus image and an ICG image. For fundus images, i2k Retina™ uses a quadratic transformation model which accurately accounts for the curvature of the retina when aligning color fundus images and fluoresceins. For working with non-fundus images, i2k Retina™ also offers similarity, affine, homography, planar (homography plus radial-lens distortion), and cylindrical (also with radial-lens distortion). See xforms-and-matched.pdf. These are accurate enough to produce well-aligned images in a wide variety of situations. Users who would like to experiment on their own have a choice of many other transformation models in addition to the quadratic model. 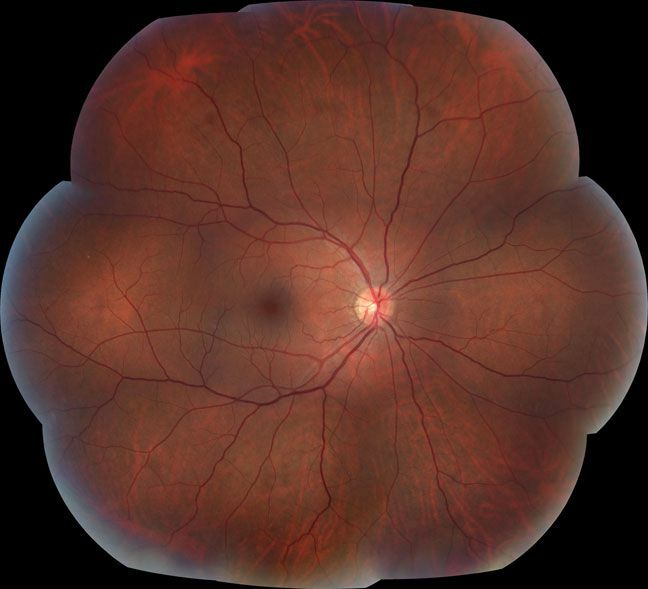 Due to the physical set-up of the image acquisition process, some non-photographic and most retinal fundus images contain an outer region that is outside the true image content. Automatically cropping this area is needed for clean montages, and it aids in the registration process, especially for low overlap images. When this exterior region is all black or all white, the masking process is trivial, but it can become considerably harder for poor quality images (e.g. images scanned from slides). By default, i2k Retina™ computes a mask for retinal fundus images, and includes an option to do this for non-fundus images. Some photographic lenses and and most retinal fundus cameras produce images that tend to be darker on the image periphery than near the image center. For photographic lenses this is due to "vignetting", while for fundus images it is caused by uneven illumination. In either case, good quality montages and better overall appearance may be obtained if this can be automatically corrected. DualAlign™ has developed new algorithms for automatically correcting vignetting and uneven illumination both in a single image and across multiple images. These are applied, if desired by the user, in the retinal image montaging process of i2k Retina™. Below is an example of the effect of this correction process on a single image. Notice the much brighter image periperhy in the corrected image. i2k Retina™ include algorithms that select seams and blending regions between images based on a detailed model of the image misalignments and color differences that remain after illumination correction. The following two montages shows the effects of using i2k Retina's tools for illumination correction and seam selection (top) and not using them (bottom). Users of i2k Retina™ can create either montage for themselves after loading the images with just a few mouse clicks.